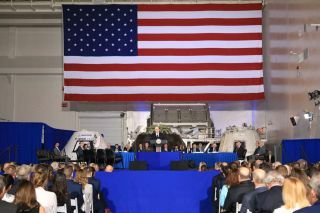 Vice President Mike Pence, chairman of the National Space Council, will convene and preside over the fifth meeting of the organization on March 26, 2019. The speakers on the second panel, "Ready to Explore," are Dan Dumbacher, executive director of the American Institute of Aeronautics and Astronautics; Jack Burns, a professor of astrophysical and planetary sciences at the University of Colorado at Boulder; and independent consultant Wanda Sigur. President Donald Trump's Space Policy Directive 1, which was signed in December 2017, instructs NASA to get astronauts to the moon, and to use Earth's nearest neighbor as a stepping-stone to Mars. NASA's current moon plans include the construction of a small, moon-orbiting space station called the Gateway, which will serve as a jumping-off point to the lunar surface. Assembly of the Gateway is scheduled to begin in 2022. NASA aims to put boots on the moon's gray dirt before the end of the 2020s. The National Space Council helps steer America's space policy. President Trump reinstated the council in 2017; it had last been active in the early 1990s, during the presidency of George H.W. Bush.